Forgive me for blogging about my cat. LJ found this amazing piece of kitch culture on the street by our apartment and presented it to me for my birthday (the cat clock behind Ida, not Ida herself, though she was also found on the street some years ago). 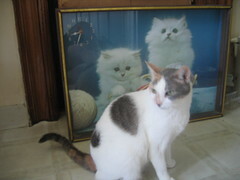 I could not resist posing the real cat infront of these two creepy, 3-D fuzzy felines. If anyone wants this, get in touch. Though I’ve recently decided my apartment is “thrift store chique” (or a clutter magnet, if you look at it differently), this doesn’t fully fit the decor. Or so I’d like to believe. Even I have my limits. This entry was posted in Brooklyn, French and tagged Uncategorized. Bookmark the permalink.